HOME > Blog > Mini Wild Greens Quiches: Crustless & Low Carb! 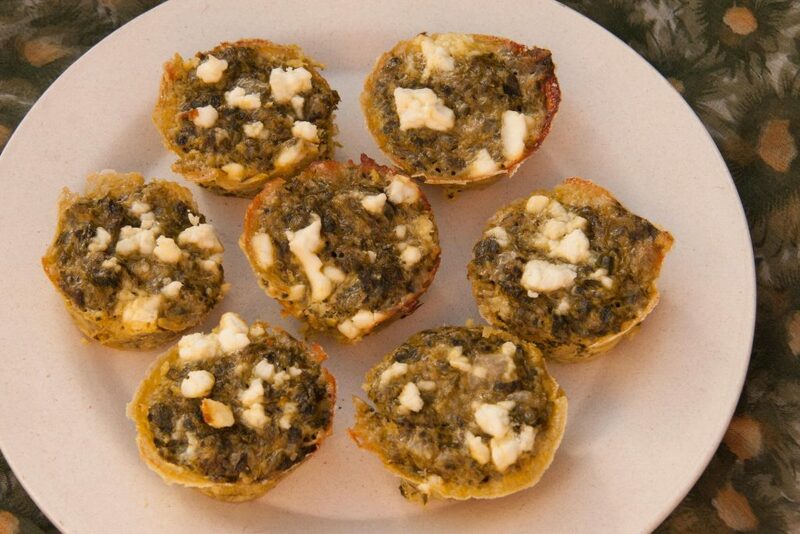 When Michael was diagnosed with diabetes, we started eating a low carb diet and these crustless, mini wild greens quiches have become a favorite. I like to make a big batch, then freeze a bunch to have on hand. A quick zap in the microwave gives you a high protein breakfast, or you can pair them with a salad for an easy lunch or dinner. I’ve even brought them to a neighborhood potluck. No one knew exactly what they were eating, but those quiches disappeared pretty darned fast, so I took that as a compliment. I had a few cups of puréed wild greens in the refrigerator, left over from making a wild greens soufflé, and they worked perfectly in this recipe. As usual, I like a combination of sharp (garlic mustard, dandelion) and mild greens (nettles, chickweed). Choose your greens according to your personal taste. This recipe works with either fresh or frozen greens. Squeeze out as much liquid as possible from the greens after blanching or thawing, then purée them in a food processor. This recipe makes 48 mini quiches.They will go fast. Preheat oven to 350F and grease a mini muffin tin. Grease it well. Whisk together the half and half, eggs, flour, salt, and pepper. Stir in the cheddar and the wild greens, then pour the batter into the greased muffin tins, filling each cup 3/4 full. Scatter a few crumbles of feta on top of each quiche and bake for 25-30 minutes, or until a skewer stuck in the middle comes out clean. Serve the mini quiches warm, perhaps with some green chile salsa or a little hot sauce.